Presently, satellite stereo survey becomes more and more popular. Many new RSD satellite will be launched in the next years and dozens are successfully operated today. 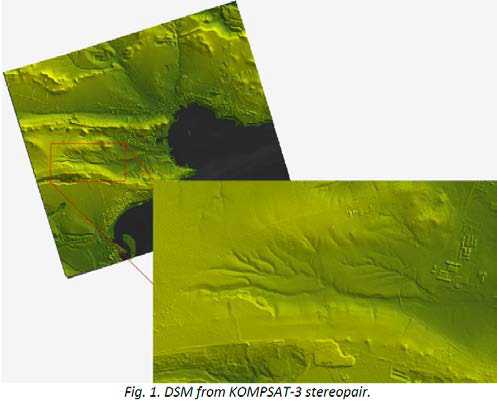 Racurs’s team has tested KOMPSAT-3 stereopair (GSD=0.8, convergence angle=44 degrees) and evaluated accuracy of KOMPSAT-3 digital surface model(DSM) vs DSM from aerial survey (GSD=0.18m). • Stereopair DSM accuracy comparing with aerial survey DSM. For more details, please download below files. 'SIIS_AN0016_Mapping_Sept.2017_Estimation of KOMPSAT-3 Imagery Potential for DSM Creation.pdf' is an application note abstracted by us, and 'Estimation of KOMPSAT' the original file written by our sales partner in Russia, Racurs that we referred to.